Brothers and best friends have a special bond, a force that makes them greater than either as individuals. That unity of vision and passion helps drive them to greater heights, and sometimes greater mischief. Life is better with friends. Terrence and his wife were on safari in the Serengeti, in Tanzania, and came upon a couple of lions lounging near a tree. They suddenly popped up to seated positions and stared intensely when they noticed a zebra grazing in the distance. While they took note of this potentially tasty meal, they went back to napping as lions hunt at night. 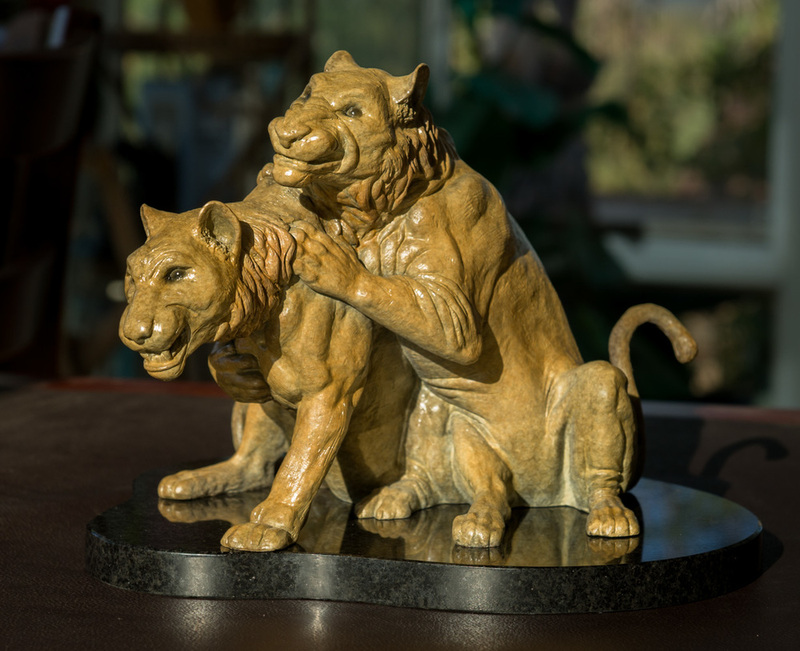 Terrence sculpted the lions in mischievous poses with very expressive faces, imagining the thoughts that must have been going through the minds of the young male lions as they eyed the zebra, looking to get into trouble. L: 13" W: 9" H: 9"